Would you like to join an intriguing English Workshop? 2. the person who wants to observe this course. 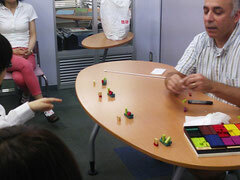 You can experience learning the English language in a group using the Silent Way approach. Donald Cherry has a Master of Arts in Teaching (MAT) from the School for International Training. He has been teaching English using the Silent Way for more than 20 years. He currently teaches English at Hiroshima International University. People are endowed with incredible learning abilities. These abilities have allowed us to evolve from crawling babies to the complex, sophisticated human beings that we are now. The number of skills we have learned in the process is beyond calculation. Too often, though, our natural learning abilities are not used well enough in language classrooms. In a misguided effort to stuff information into students’ heads, students are prevented from developing the skill of speaking a foreign language. In this course, we will more fully respect the remarkable learning powers that students bring to the classroom. The same powers that have served us all so well in learning so much will be used here to bring students closer to the melody, the structures, and the spirit of English. We will work as seriously and as playfully as children first learning how to jump rope. We strongly suggest those who would like to observe this course attend at least one full day, preferably more. Students will work to improve their production of English sounds. They will do this by practicing these sounds and receiving constant feedback on their production from the instructor. Students will use all tools available to them, including their ears, eyes and mouth, to develop their own inner criteria so that they may become more independent and more effective learners. Students will work to describe and talk about situations that are clearly illustrated in the classroom. Applications will not be accepted after the maximum number of participants has registered. *If you have no exposure to the Silent Way, we strongly suggest you attend from the first day!!! *Please remit the fee after you receive the confirmation from us. *We will issue a receipt on request. The maximum number of students for this course will be 20. Students registering for the full 5-day course will be given preference over those registering for just a day or two. How did you know this workshop?